Endurance was the name of a ship. 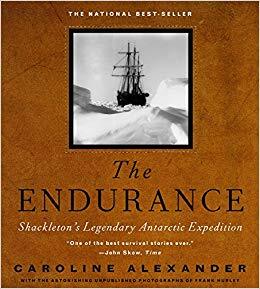 The Endurance is the title of a book, American author Caroline Alexander’s spellbinding account of the British explorer Sir Ernest Shackleton’s expedition to the Antarctic aboard that ship. On 5 December 1914, the aptly named Endurance, with twenty-eight men aboard—sailors, scientists, explorers, and a photographer—set out from South Georgia Island in the South Atlantic. Shackleton intended for the ship to set him and his exploring party ashore at Vahsel Bay in the Weddell Sea, and from there to cross Antarctica on foot. If they had succeeded, it would have been one of history’s last great feats of exploration. They never reached the continent. The pack ice in the Weddell Sea never broke up in that southern summer, and by the middle of January 1915, the Endurance was trapped in it. The story of the next twenty months is an epic tale of survival against the odds. They drifted on the currents for hundred of miles before the ship was crushed by the ice in October 1915, then camped on ice floes, crossed open ocean in lifeboats, and endured storms, starvation, hypothermia, and frostbite. Miraculously, all twenty-eight men survived. The account of that saga includes true events that, if this was a work of fiction, would have you shaking your head and thinking, Oh no, you can’t expect me to believe that. The accompanying photographs—remarkable in themselves for surviving a journey in an open lifeboat and months buried in snow—help bring the story to life. We see these men as real people, and glimpse the grandeur and bitter cold of the Antarctic. The book raises some questions about the wisdom of the expedition’s aims, and their readiness for Antarctic conditions, but the focus is on Ernest Shackleton’s leadership abilities, and what it took to bring all of them home. In the end, this is more than just an adventure story, it is a paean to the human spirit. Audience: Anyone interested in the history of exploration. This entry was posted in History (non-fiction). Bookmark the permalink.